Last weekend was the second week of the Mud Festival at Daecheon Beach in Boryeong. We hadn’t planned on going, but after much coaxing and everyone promising we’d be missing out, Clint and I joined some friends on the quest. The train ride to Boryeong was beautiful and extremely pleasant. There’s even a bar in the first car. We saw a lot of Americans hanging about there. Clint and I were both expecting complete mayhem, but were surprised everything was quite organized. The mud obstacle courses were smack in the center. Anyone who wished to enter had to purchase a ₩5000 ticket – fairly cheap for how much fun everyone was having. Clint and I opted to explore the surrounding beaches and people watch. We sure do love people watching! Korean models advertising various brands in bikinis/shorts and heels. Heels on the beach. Yeah, that makes sense. The Peace Initiative walking around demanding participation. 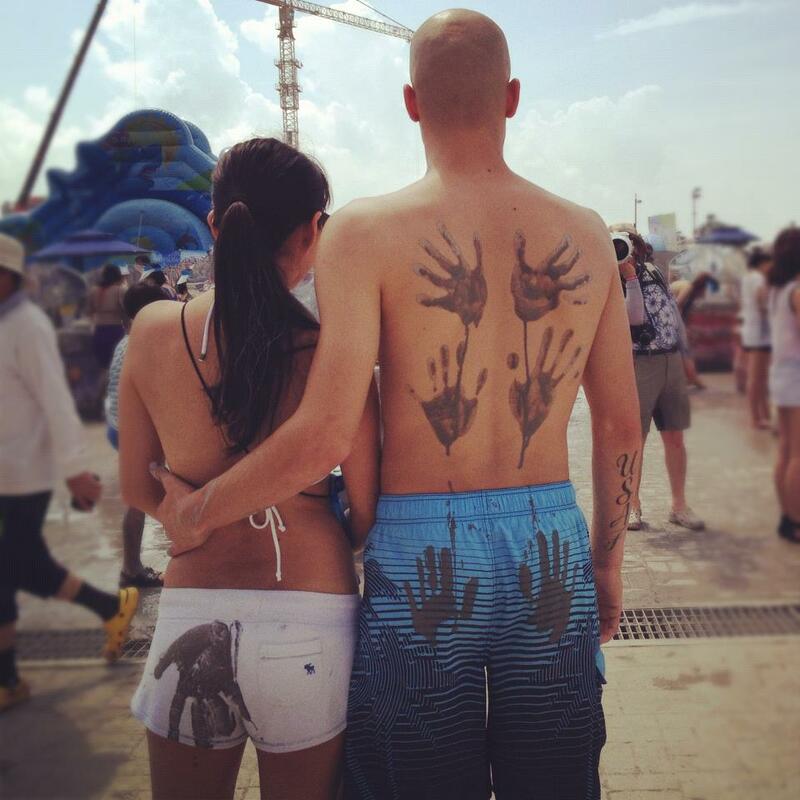 Mud painting stations allowed for cleverly-placed hand prints all over Clint’s body – which yielded a very creative tan! ₩3000 showers are a rip-off. Tons of seafood restaurants along the adjacent roads. We went into a random one, and it was crazy fresh and delicious grilling! We alternated between mud painting, snacking and drinking for Clint, and the beach. It was a little too cold for swimming, but good fun to play in. In the end, we’re really glad we went! I definitely suggest anyone in Korea to make the trip there next year. Previous PostWelcome to A-Town – I mean… International Culture Ville!